Old Linslade Winding Hole is a place on the waterways minor waterways place place on the waterways major waterways place village town city on the Grand Union Canal (Grand Junction Canal - Main Line - Gayton to Brentford) between Willowbridge Bridge No 99 (4 miles and ½ furlongs and 4 locks to the northwest) and Marsworth Junction (Junction of Grand Union Aylesbury Arm with Main Line) (10 miles and 3¾ furlongs and 12 locks to the south). 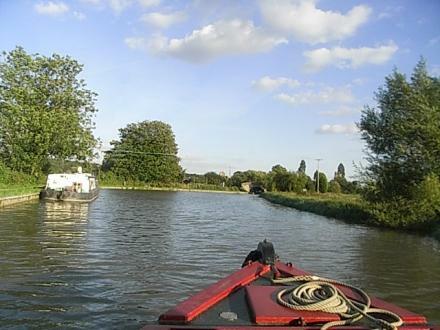 The nearest place in the direction of Willowbridge Bridge No 99 is Milepost - Braunston 44 Miles; ¼ furlongs away. The nearest place in the direction of Marsworth Junction is Old Linslade Road Bridge No 110; ½ furlongs away. Helston — 680 yards to the east. 14 Heath park drive, Leighton Buzzard, LU7 3BF — 1598 yards to the east. Plantation Road, Leighton Buzzard — 1201 yards to the east. Touchwood, Leighton Buzzard, LU7 3JE — 1125 yards to the east. Leighton Buzzard — 731 yards to the southeast. Globe Lane, Leighton Buzzard, LU7 2TA — 948 yards to the southeast. Linslade Road, Heath and Reach, Heath and Reach, LU7 0EB — 1581 yards to the north. Stoke road, Linslade, LU70DU — 1493 yards to the south. Plantation Road, Leighton Buzzard, LU7 3JF — 1018 yards to the east. The Osiers Farm, Taylor’s Ride, Leighton Buzzard — 1132 yards to the east. Leighton Buzzard — 1579 yards to the south. Milton Keynes — 132 yards to the southeast. Leighton Buzzard — 1461 yards to the south. Leighton Buzzard — 1587 yards to the east. The Willows,Old Linslade Road, Leighton Buzzard, LU7 0DU — 103 yards to the southeast. 16 Corbet Ride, Leighton Buzzard, LU7 2SF — 1459 yards to the south. Plantation Road, Leighton Buzzard, LU7 3JE — 1053 yards to the east. Leighton Buzzard, LU7 3HT — 1201 yards to the east. 14 Lincombe Slade, Leighton Buzzard, LU7 2SG — 1425 yards to the south. Leighton Buzzard — 1423 yards to the south. High Street, Leighton Buzzard, LU70HR — 1261 yards to the east. Tiny Toes Reflexology and Baby Massage Leighton Buzzard. Linslade — 1467 yards to the south. Leighton Buzzard, LU7 — 961 yards to the east. Heath Court, Leighton Buzzard, LU7 3JR — 899 yards to the east.